Recently I shared that I use hand motions often when teaching to not only help keep my kinders engaged both mentally and physically but that I use them to help five year olds recall which skill I am asking them to practice. I shared my tips for teaching rhyming which actually involves concepts of beginning sounds, onset and rime. 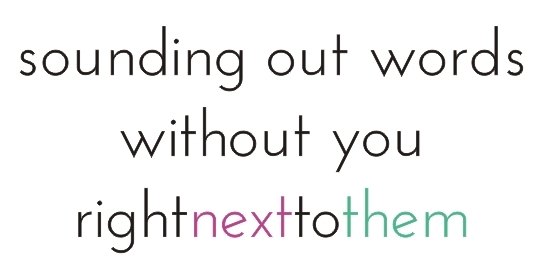 When it comes to growing readers and writers, and growing up writers who will attempt to sound out words… without you right next to them, sometimes we face a challenge. Here is how I’ve attempted to implement a set of hand motions and a simple tool to face that challenge head on. When working whole group or even in small group reading sessions, we use hands that almost appear to be “praying hands,” to give you a visual. Then for each phoneme, or sound, we move our hands out away from each other. When we are ready to blend them back together, then the hands are using a clapping motion. Out and in. In order to make students actually feel the separate phonemes, I introduced the world’s best tool! Yes, it is just a rubber band. But they think it’s totally cool because this is a tool they can have and keep in their tool box. Why? I have just empowered each of my kinders to try, practice, improve and grow on their own. I’ve always got a rubber band lying around and it travels with me while conferencing with students… Practicing CVC games during a small group session? Rubber bands are at hand! Using these same hand motions, I model the concept of segmenting a 7-10 letter word from the books my students are reading. They enjoy watching me squirm as I frustratingly try to blend a word that is just to long to remember the phoneme sequence. I use this as a teaching point and discussion to model using segmenting and blending bits we know (blends, digraphs and vowel patterns). 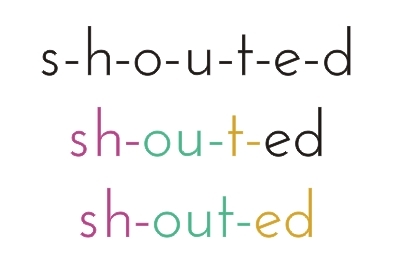 Blending the word SHOUTED for example, is much easier when it’s segmented as SH-OU-T-ED or even SH-OUT-ED. Three to four bits are definitely easier to manage than seven! As with anything we do, we’ve practiced whole class and set expectations for using these. K.RF.2.e-1. Blend at least three phonemes together to state one-syllable words. K.RF.2.e-2. Segment one-syllable (3 phonemes) words into phonemes. I hope you catch a kinder out of the corner of your eye repeating these motions on their own as you see them practicing what you teach! Leslie, I’ve been following you for years. How did I not know you had all of this knowledge and helpful tools and tips on here? I’ve been exploring your blog and pinning like crazy! Thank you so much! I am a veteran teacher who is trying to work smarter, not harder these days. Keep up the wonderful work! I have purchased a bunch of your items today on TpT as well. Thanks Penny -wonderful to have you here! Love this! I have some kids in Title 1 Reading that would benefit from this. Love your site and resources. Thank you soooooooo much!!! You’re welcome – I hope it can help! I’ve used tapping the arm as you move your hand down but I like this one also! Just shared to FB; thanks for the tip! I feel like we need to continually present new methods, tips, and tools because all students learn differently; you never know which approach will work best for them. Thank you for sharing! Love it. Thanks for sharing Shelley! You are telling the truth that many different approaches will help them all learn! I’m going to use the rubber bands in small groups next week. Thanks for the tip. We also use putting up one fingure at a time for each sound we hear. It works great but I was in need of something different. Great tip as always. I hope to share this suggestion with my students and their parents soon! Thanks! Hope it can be helpful to each of them that give it a whirl!